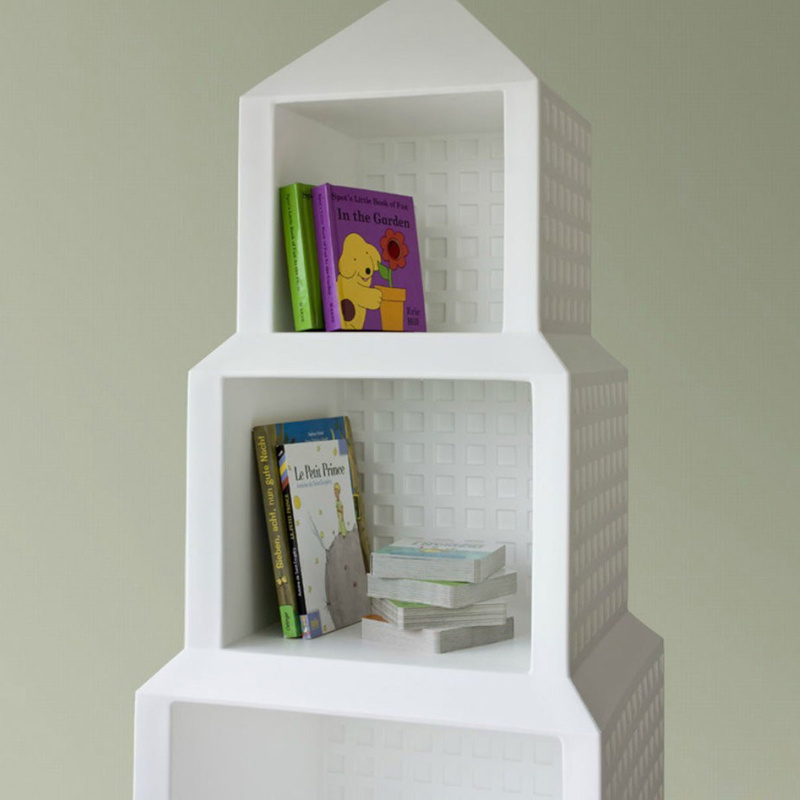 Downtown bookcase, made entirely of polyethylene, ideal for any space in your home. This library, which measures 183 cm in height, 54 cm in length and 51 cm in depth, is well suited to the needs of modern homes, occupying in its entirety a very small space, but having, despite this, an enormous capacity for containment. 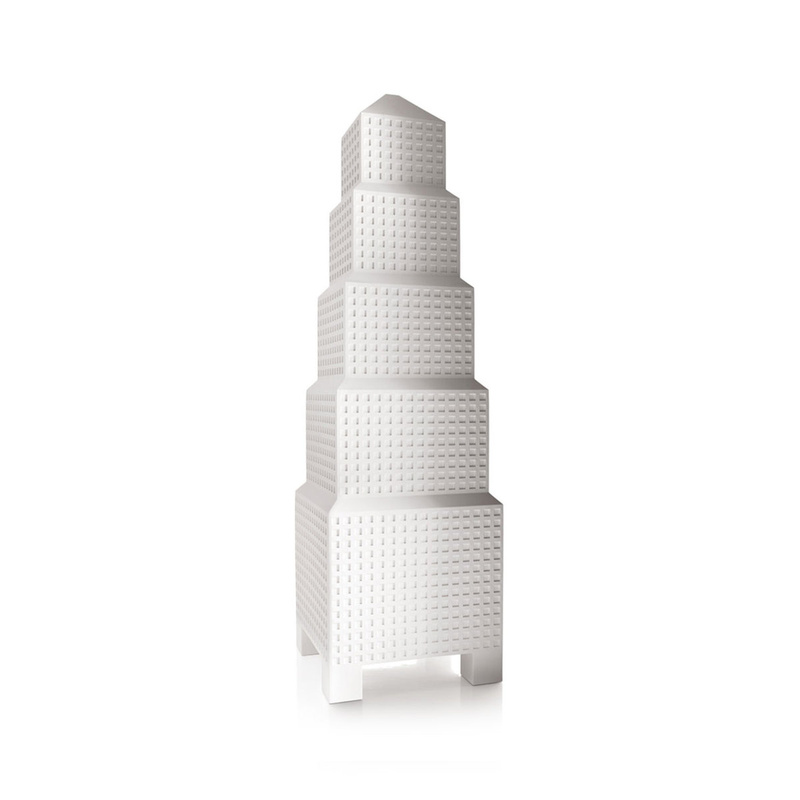 Its characteristic pyramidal shape is given by a block of five cuboid containers, each of which is reduced in size as it approaches the top of the pyramid. Each cube is finely carved by a series of stylistically similar squares, placed both on the inside and on the outside of the pyramid. The bookcase rests on a block of four feet, which allows it to bear a considerable weight, giving stability to the entire structure. Therefore, the product is suitable for both functional and logistical needs: you can in fact arrange carefully in each of the books cubes, but also any other object of your liking, so that you can resume them at your convenience and with extreme comfort. In addition, you can use the highest block, and therefore less accessible to children, to store exhibits of particular value, which will adapt in an original way to your style, coming in perfect harmony with the product. The bookshelf also looks magnificent from an aesthetic point of view, and will arouse the curiosity of all visitors to your home. In short, you are not facing a simple bookcase, on which to place books or various objects of your liking, but to a real example of multi-purpose furniture for your home. You can decide to put it in the kitchen or in the living room, as well as in the bedrooms: rest assured, we do not create limits, we can only ensure that the library will become the master of the environment, for its aesthetic characteristics, which make it absolutely unique in its kind. In short, you decide which use to make, based on your personal tastes: we guarantee you maximum quality and great success with all your friends. Professor Oiva Toikka is one of the greatest names in Finnish glass. His imaginative, rich and bold glass art deviates from the streamlined aesthetic of Nordic design. He has worked in the performing arts for as long as he has in glass. The Birds collection is Toikkàs best-known work. 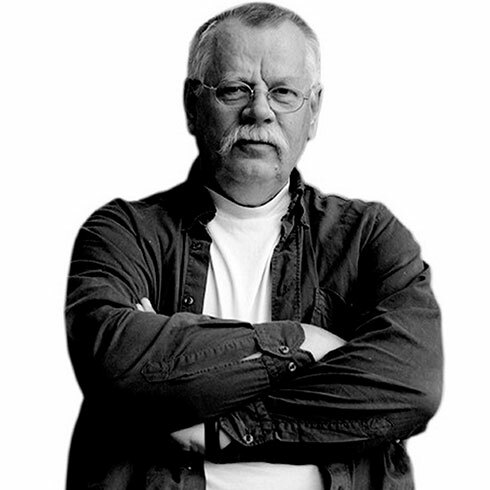 He has enjoyed an international career and received numerous awards, among them Lunning Prize, Pro Finlandia Medal, World Glass Now 85 Award, Kaj Franck Design Prize and the Prince Eugen Medal.